Translated from Buryat, “sagaan sag” means “white time” — when travel links between Olkhon Island and the mainland are suspended until the ice appears. Baikal is immersed in fog, while locals have just one simple question: where to catch fish and get water? Olkhon Island is a sacred place for Buddhists and shamans. It’s always sunny here, and there are only 30 cloudy days a year: from mid-December to mid-January. During this time Baikal slowly but surely starts to freeze over; but the ice is not yet strong enough for vehicles, making the island off-limits to tourists. Baikal is enveloped in thick fog, temporarily screening Olkhon and its inhabitants from the outside world. In the emptiness of this snow-covered island, man becomes a small part of a larger world. The days merge endlessly into each other, as local folk while away the time on domestic matters. Every winter morning Viktor rises at 7 am, heats the stove and gets busy around the house. An old-timer now, he’s used to an austere lifestyle and refuses to be cared for by relatives. Viktor used to fish aboard ships belonging to the local fish factory, but it was closed down. Viktor lives with a cat called Vasily, who lends a paw in everything, especially when it comes to reading and writing letters to friends. Viktor makes wine from Siberian berries and birch sap. There’s no plumbing on Olkhon Island, so until the freeze-over locals take their cattle to Lake Baikal to drink. At other times water is brought from the water carrier. 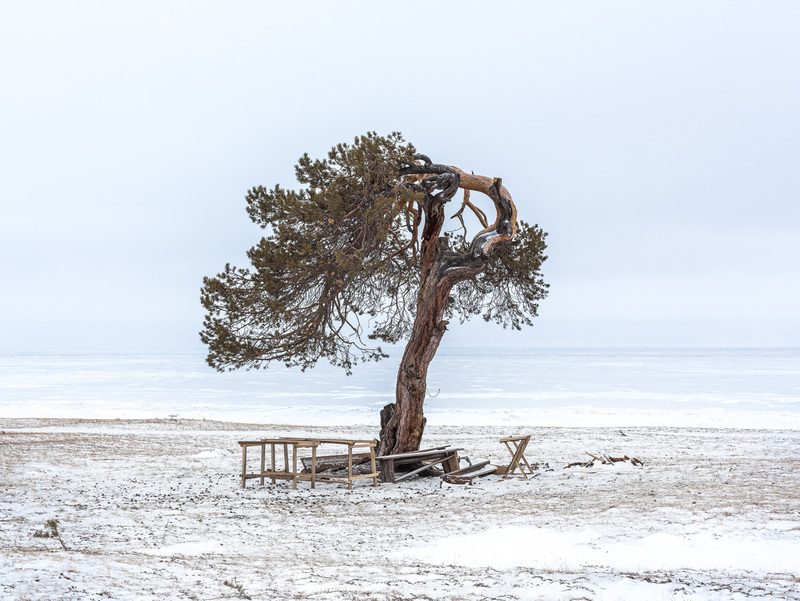 The strong winds on the shore of Olkhon Island have bent many pines over backwards. Locals call them “walking” trees. One of the Olkhon airport buildings. In summer the island can be reached from Irkutsk by private small aircraft. In Soviet times such flights were weekly. In summer, maritime navigation on the Maly Sea (part of Lake Baikal separated from Olkhon island) is regulated by a series of lighthouses. Baikal experiences major storms. For example, in late September 1902 the ship Alexander Nevsky was badly damaged on the Maly Sea, wrecking the barges being towed, aboard which fishermen and their families were returning after the fishing season. A memorial to a drowned young man. Because it's a Buryat grave, offerings have been left. The skeletal hulls of fishing vessels that once belonged to the local fish factory. It opened in 1932, but today barely operates. The island is home to a local Cossack community, which peacefully coexists with the Buryats. The island is generally tolerant of all religions: Buddhism, shamanism and Christianity.